Elephants have eyes that are small in proportion to the size of their heads: it is quite hard to locate their eye sockets at the sides of their skulls. On the contrary, their large nasal cavity right in centre of their foreheads, the hole where their trunks begin is very obvious. In Sicily, two species of elephant once lived: Elephas falconeri, extinct for half a million years, and Elephas mnaidriensis, that lived on the island up to 40 million years ago. They were small-sized species: the first was around one metre in height, while the second was no more than two metres tall. The elephants arrived in Sicily overland, when the level of the Mediterranean Sea fell by many metres during the last ice age. Then, when the sea level began to rise again, the elephants stranded on the island continued to breed but, as the generations went by, they became increasingly smaller: this is a phenomenon well-known in biology, called insular dwarfism. It may be advantageous for a large-sized species arriving on an island to become smaller as the generations follow one another in order to optimise the limited resources of a restricted environment. Moreover, the absence of large predators that need huge hunting territories helps to make extra-large size superfluous as a means of defence. Insular dwarfism is not limited only to elephants: Flores is a small island belonging to the volcanic Sunda archipelago, in Indonesia. People living on Flores in the village of Rampasasa are tiny, with an average height of 145 centimetres. In 2003, some very interesting fossilised human remains were found in a cave close to Rampasasa. It was a partial skeleton of a hominin barely one metre tall and with flat feet. Immediately identified jokingly as one of the Hobbits who Tolkein wrote about, the Flores man is not an ancestor of the pygmies currently living on the island: Homo floresiensis belongs to a different species, discovered only recently, living on Flores up to 17 thousand years ago. They were small men, no taller than a modern day child aged about 4 years, but already able to light fires and create and handle stone tools to hunt and butcher animals that were often larger than they were. Insular dwarfism is often accompanied by the opposite phenomenon: insular gigantism which, on the contrary, determines the enormous size of animals that are usually small on the continent. On an island with no large predators, small sizes are superfluous because there is no need to flee claws and tusks by hiding in holes. 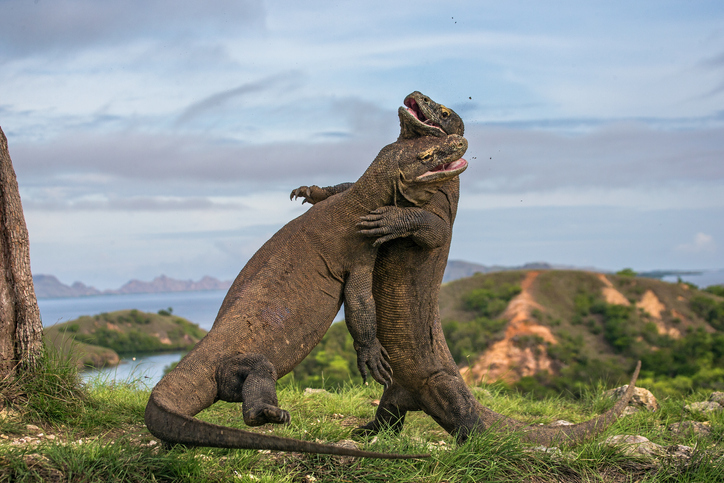 This is the reason why gigantic animals, like Galapagos turtles and Komodo dragons, can be found on some islands. The majority of insular giants became extinct when humans arrived with their domestic predators: dogs, cats and rats. However, large-sized dwarfs, such as the Tenerife giant rat, as big as a rabbit, and the giant lemur on Madagascar, as large as a gorilla, were once very common. There was once a time when giants lived in Sicily too. They were the Cyclopes, the children of Gaia the Mother Earth goddess and Uranus the Father Sky god, and they were blacksmiths living below Mount Etna were they forged the thunderbolts for Zeus and Hephaestus, the god of fire and metalworking. The main characteristic of Cyclopes, besides gigantism, was a single eye in the centre of their foreheads. They were not savage and primitive, it was Homer who described them so: his Polyphemus was a violent giant, a cave-dwelling shepherd who was partial to eating humans. What were the Cyclops doing in Sicily? Seeing the fossilised skull of a dwarf elephant, it would be easy to think that it belongs to a mythical monstrous character: a one-eyed giant… But that is a whole different story.